Temperatures this morning were in the low teens here, and the wind has not stopped howling since early Sunday. It made for a rough day out there, as I attempted to frame a deck in, while trying to keep the lumber from blowing away. For the first time this season, the long underwear top went on, as did the flannel-lined Carhartt jeans. I do love those pants. Barrow, AK on 15 October 2016. Photo credit: Barrow Sea Ice Cam! Utqiagvik, also known as “The Community Formerly Known as Barrow”, set a new record this autumn for the latest accumulation of snowfall. The old record was October 12, set in 1998, and every day without snowfall extends the record. 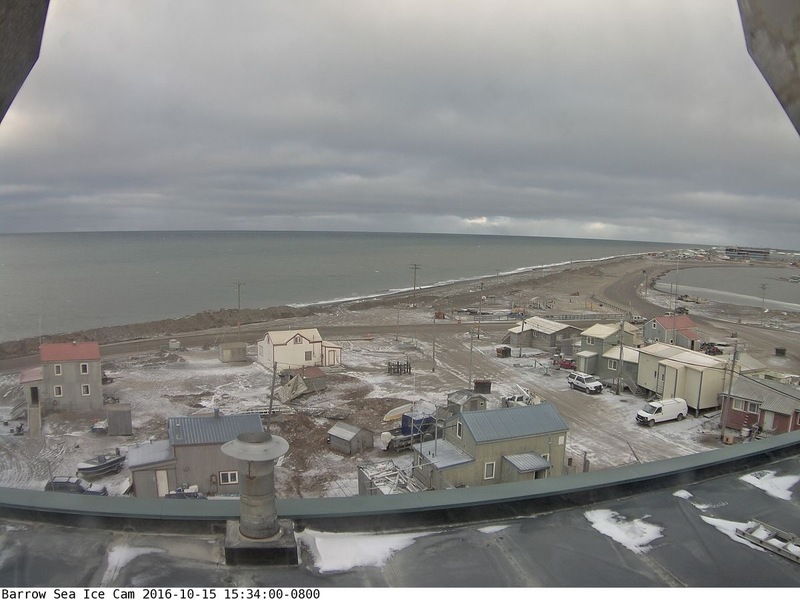 Utqiagvik has seen flurries, but nothing measurable. The first ten days of October saw Utqiagvik hit record warm temperatures. During that period, temperatures averaged 10.4 degrees above normal. It should be noted, that “The Community Formerly Known as Barrow” also experienced a record early snow melt this past May. That record beat the old one by 10 days. The northern Alaska community voted earlier this month to change the town’s name from the English “Barrow” back to the Inupiaq “Utqiagvik.” The vote was: 381 votes in favor to 375 votes opposed. Utqiagvik is pronounced Oot’-kee-ahg’-vick. This entry was posted on Tuesday, October 18th, 2016 at 2:26 AM	and tagged with barrow, history, photo, record, snow, travel, weather and posted in Alaska. You can follow any responses to this entry through the RSS 2.0 feed.